Provide comfort for the family of Ruby Smith with a meaningful gesture of sympathy. Ruby P. Smith, a native of Frankville, AL and resident of Deer Park, AL passed on Thursday, April 4, 2019 at the age of 93. 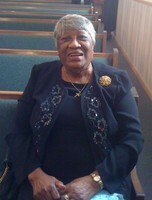 She was a member of New Light MB Church in Deer Park, AL. She was preceded in death by her husband: Johnnie Smith; parents: John and Eva Parker; two sons: Leenwood Smith and Robert Earl Smith. She leaves to cherish her memory three sons: James (Stacey) Smith, Joseph (Sherri) Smith and Tracy J. Smith; five daughters: Richetta S. Dixon, Helen S. Lucious (caregiver), Annette S. (James) Dixon, Alice S. Turner, Anna S. Garner; 18 grand; 41 great grand; 21 great great grand; one godson: Robert (Della) Henderson; one sister: Marie Williams; one brother: Arthur Parker; numerous nieces, nephews, other relatives and friends. We will miss her dearly. Her remains will lie in state on Friday, April 12, 2019 from 1-8pm at Small's Mortuary, Mobile. A visitation will be held on Saturday, April 13, 2019 from 10am until the 12pm Homegoing Celebration at New Light MB Church, 1591 Deerpark Burbank Rd, Deer Park, AL. Interment will follow in New Light Cemetery. To send flowers in memory of Ruby Smith (Parker), please visit our Heartfelt Sympathies Store. Provide comfort for the family of Ruby Smith (Parker) by sending flowers.